What kinds of things should I consider as I prepare to study abroad? How will my credit transfer? What is it really like to spend a semester or year abroad? How can I talk to other students who have studied abroad? The 2018-2019 Peer Advisor is Emily Churchill, a senior from Pennsylvania who has studied abroad five times as a Richmond student. She participated in the Summer Study Abroad program in Seville, Spain after her freshmen year then returned to the program the following summer as an assistant to the professor in charge. 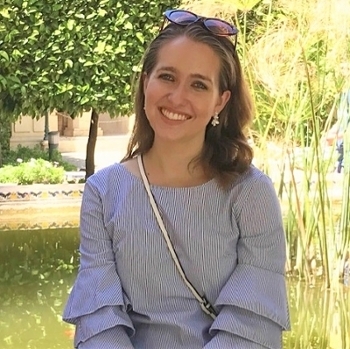 She spent the second half of that summer in Morocco before spending a full year in Granada, Spain with the Institute for the International Education of Students (IES Abroad). She was a blogger for the Granada program and IES Abroad named her their Correspondent of the Year. In summer 2018, she interned at the U.S. Department of State’s Education USA office in Cuenca, Ecuador, helping local students apply to college in the United States. Emily’s study abroad experiences have challenged her to grow in many different cultural contexts. As the Study Abroad Peer Advisor, she will raise awareness about all forms of study abroad and help students find programs that will allow them to reach both their academic and personal goals. Students may walk in to see the Peer Advisor during these hours without an appointment. Mondays: 8:30 a.m. – 10:30 a.m.
Wednesdays: 8:30 a.m. – 10:30 a.m.